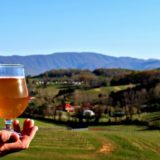 Great Valley Farm Brewery is a small farm brewery located on 27 acres in the Natural Bridge area. We specialize in producing beers in the Belgian farmhouse tradition using many ingredients from our farm, as well as other local farms. Please stop by to enjoy a beer and the scenic views of the southern Shenandoah Valley. Open Wed - Th 12-7pm, Friday-Sat 12-8pm, Sun 12-6pm. Pets, Kids and Groups welcome. Wheelchair Access.